Is this a replica of the goddess of love, beauty and pleasure? I hope so. 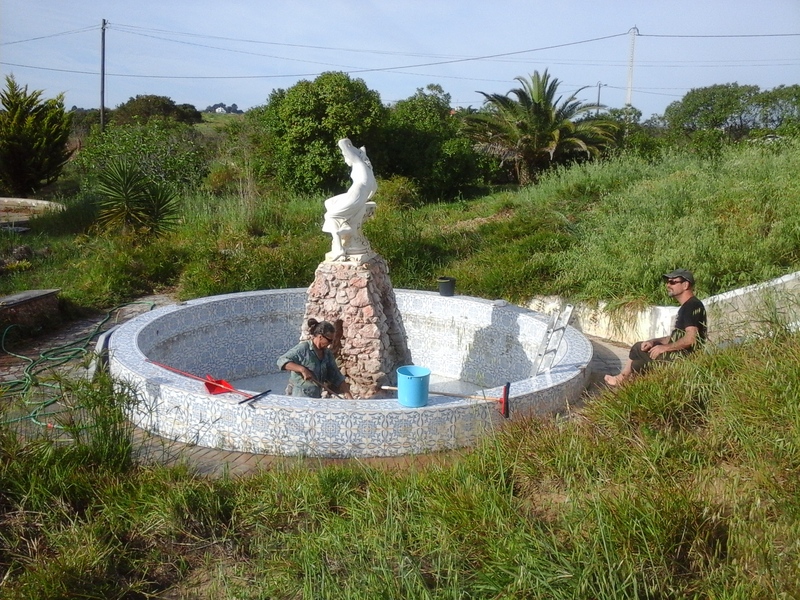 We inherited this sculpture and the blue and white tiled fountain with the property and we have not figured out yet which artist created the original. She certainly looks beautiful and seductive and these days Muhabbat and Ramapada (originally from Germany and California, but nowadays from Ecuador) made efforts to restore the fountain in its original glory. Our pool is now full and ready for all kinds of aquatic fun, aerobics, dance, floating, therapies and exercise. Or you can just swim in it, or meditate. The water is so clean you can drink from it, and it does not smell of chemicals or hurt the eyes. We ask you all to help keep it that way. Pool pollution is mainly caused by swimmers and this can easily be avoided by strictly observing sensible rules of pool hygiene. In the water: Sarah from Louisiana. We used the A-frame again to draw the contours for terracing this somewhat steep slope. The amount of material needed to build an almost 1 meter high wall around the projected terrace got me thinking. Then I remembered reading about Agritecture, the art of growing and weaving your walls from tree branches instead of building them. Low-cost and ecological, it just takes more patience. Let’s try. 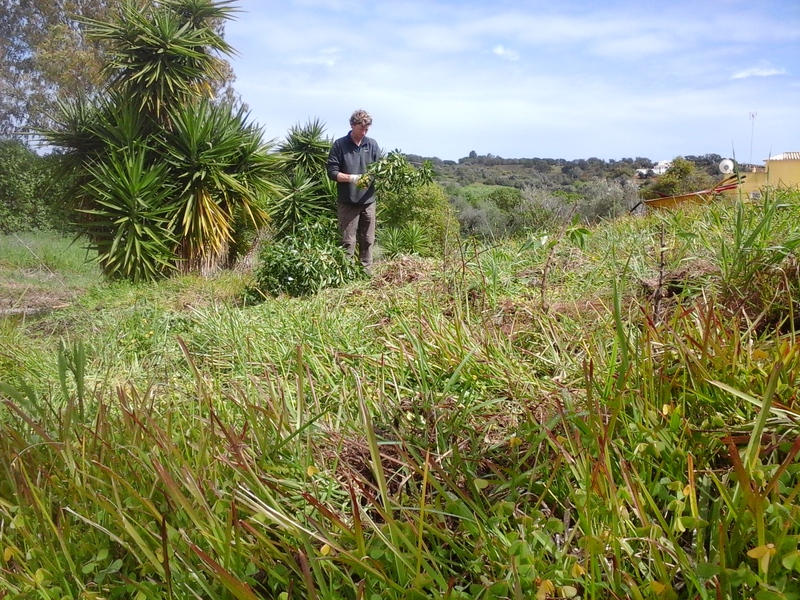 Aidan is planting a row of cuttings here, taken from a hedge that we are pruning elsewhere. Making a new vegetable garden starts with planning and preparing beds. 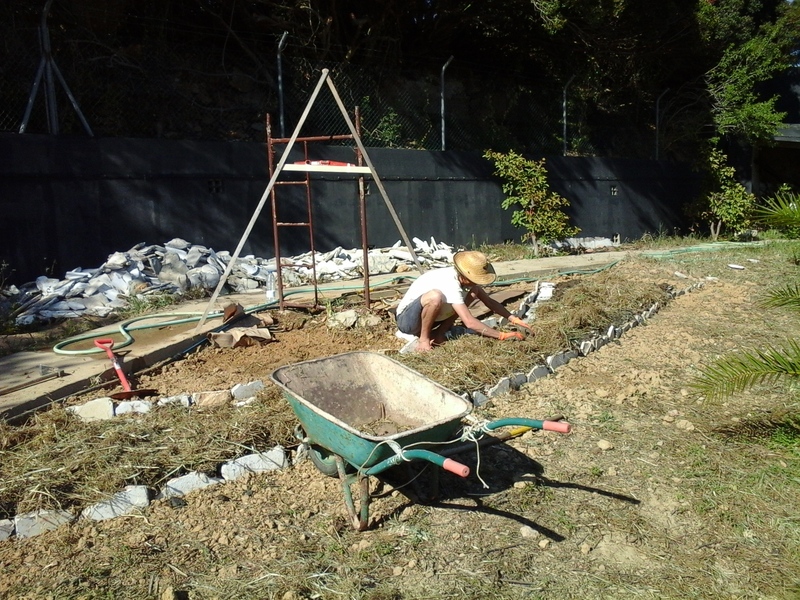 The site has a slight slope and vegetable beds are best made level. In this picture you see an amazingly simple and accurate way to quickly find the contour lines: An A-frame level, made of three wooden slats and a water level. We cover the soil with cardboard, to stop the weeds and seeds from regrowing. On top layers of compost, hay and wood chips. This keeps the moisture in, and slugs and snails out of the beds.